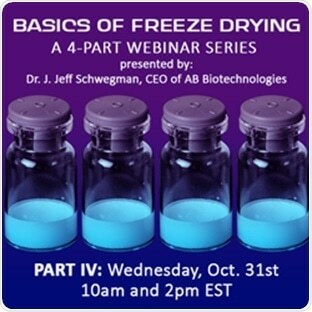 Presented by renowned freeze-drying expert - Dr Jeff Schwegman there will be two sessions of this free webinar entitled "Scale-Up, Cycle Transfer, and Maximum Throughput Capability" on 31st October 2018. Topics to be covered in the webinar will include critical parameters in scale-up and cycle transfer, scale-up strategy, mapping studies, dryer configuration, determining and preventing choked flow conditions and tips and techniques on how to freeze dry more efficiently. Attendees to each of the live sessions are encouraged to ask questions of the presenter and get their answers in real time at the conclusion of the presentation. SP Scientific LyoLearn™ educational webinars are held monthly and devoted to lyophilization current research interest and related topics, and delivered by industry experts.